1. Carndonagh. Ringless Cross. Close up of the Head of the Cross. 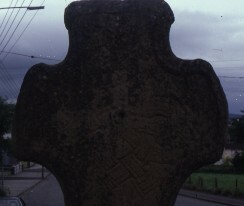 The ringless cross is situated at the roadside just outside the Church of Ireland in Carndonagh Co. Donegal. Its measurements are 2.53 m high, 1.1 m span, 68 cm width and 19 cm thick. E2 The Crucifixion. New Testament. This side has 4 unidentified long robed figures, placed one above the other on the shaft. This is a close up of the head of the cross. There are two broad strands of interlace and at the centre there are three birds with curved beaks. Crawford, H. S., , ‘The Crosses and slabs of Inishowen’. In Journal of the Royal Society of Antiquaries of Ireland (1915) 45, 183-192. Curle, C. L., , ‘The Chronology of the Early Christian monuments of Scotland’. In Proceedings of the Society of Antiquaries of Scotland (1939/40) 74, 60-116. De Paor, L., , ‘Cross and Carved Stones’. In Rosc '67 (1967) 129. De Paor, L., , ‘The Christian Triumph: the Golden Age’. In Treasures of Early Irish Art 1500 B.C. to 1500 A.D. (1977) 93-104. Doherty, W. J., , ‘Some Ancient Crosses and other Antiquities of Inishowen, County Donegal’. In Proceedings of the Royal Irish Academy (1893) 18, 100-116. Harbison, Peter, , ‘On some possible suorces of Irish High Cross Decoration’. In Festschrift zum 50jahrigen bestehen des vorgeschichtlichen seminars Marburg. Marburger Studien zur vor- und frühgeschichte I (1977) 283-297. Frey, O.-H., Festcshrift zum 50jahrigen bestehen des vorgeschichtlichen seminars Marburg. Marburger Studien zur vor- und frühgeschichte I 1, , Gladenbach (1977) . Harbison, Peter, , ‘A group of Early Christian carved stone monuments in county Donegal’. In Early Medieval Sculpture in Britain and Ireland, British Archaeological Reports, British Ser. 152 (1985) 49-85. Higgit, J., Early Medieval Sculpture in Britain and Ireland, British Archaeological Reports Ser. 152 1, , (1985) . Lacy, B., Archaeological Survey of County Donegal 1, , Lifford (1983) . Leask, H. G., , ‘Irish Architecture and Sculpture durnig the Early Christian Epoch’. In Christian Art in Ancient Ireland (1941) 2, 77-86. Nordenfalk, C., , ‘Before the Book of Durrow’. In Acta Archaeologica (1947) 18, 141-174. Roth, U., , ‘Studien zur Ornamentik frühchristlicher Handschriften des Insularem bereiches’. In Ber RGK (1979) 60, 5-225. Rowan, A., North West Ulster 1, , Harmondsworth (1979) . 96th Annual Report of the Commissioners of Public Works in Ireland 1, , Dublin (1929) . unknown, unknown, , ‘missing’. In Journal of the Royal Society of Antiquaries of Ireland (1902) 291-293.